A litter of eight enjoying raw. Our dogs are fed an exclusively raw food diet. This diet consists of raw meat, raw tripe, raw meaty bones, raw fish and vegetables and is sometimes referred to as BARF. A BARF diet or Biologically Appropriate Raw Food is a modern day adaptation of the diet wild dogs have evolved to eat after hundreds of thousands of years in the forests and scrub land of the world. Raw feeders are generally unable to feed whole prey to our dogs but we can instead source quality meat, bone and organ tissue to emulate the carcass. Feed fruit and vegetables to reproduce foods found in the gut of the kill – In short dogs eating as nature intended. Dogs, both domesticated and wild, are members of the carnivore family, and are anatomically built for eating meat. Their teeth are designed for tearing and chewing, their short intestines avoid the putrefaction of flesh foods, and the powerful digestive juices can even dissolve lumps of bone. The main reason I have chosen this diet for my dogs and in turn the puppies I raise is quite simple really. Feeding this way avoids grains, starches, additives, fillers and preservatives found in almost all commercial dog foods available today. I know exactly what my dogs are eating and can adapt their diet to suit there needs. Other benefits also include a reduced doggy odour and 'dog breath'. Naturally clean white teeth - no need for toothbrushes or de-scaling. Chewing raw meaty bones helps prevent gum disease leading to improved general health but, even more importantly, the dogs love it! Meat in its natural raw state is more beneficial as cooking breaks down many of the proteins and amino acids in raw meat, destroying much of the nutritional goodness. It does not include all the fillers of commercial pet food so less is needed to provide a balanced diet. This in turn leads to the dogs producing firmer, smaller poos that are easy to pick up. 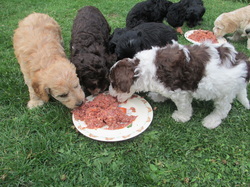 A further benefit of weaning our puppies onto a raw diet is that they develop at a more appropriate rate. Quick growth spurts are avoided. They also have lovely white teeth, bright shiny coats and proven steady temperaments. The base of my raw feeding is complete raw food from Natural Instinct and Nutriment. Both companies are founded on the simple premise that dogs and cats deserve a healthy, biologically appropriate, balanced diet made from all-natural human grade ingredients with no cereal or fillers. They use only the very best DEFRA approved British meats and premium quality fruit and vegetables, ably supported by a host of natural supplements such as spinach, sea kelp and Scottish salmon oil that combine to ensure a balanced meal brimming with essential nutrients. I also substitute feed raw meaty bones, tripe, fish and a variety of different meats. I feed lamb necks, lamb ribs and whole chicken carcasses or wings. I also feed meals of sprats or mackerel. This all goes towards providing a healthy, natural and balanced diet for my dogs. You should never feed bones that have been cooked as they become brittle and can splinter. You should also avoid weight bearing leg bones. Swapping between meat minces and bone ensures teeth are kept clean and keeps the range of food interesting. I get a real sense of joy from feeding and rearing my dogs on this natural diet. Raw feeding should not be daunting, it is an easy, economic way of feeding your dog the very best of natural foods. Using a complete raw food that has all the correct ratio of bone, meat and veg is the easiest way to feed your dog a raw diet allowing you to add a more 'DIY' approach as you become more confident on what is appropriate to feed your dog. Several companies will deliver to your door, they have a whole range of raw food which is as convenient as opening a bag of complete kibble. The companies we use are Natural Instinct, Nutriment and Manifold Valley Meats but there are numerous companies who all deliver direct to your door.